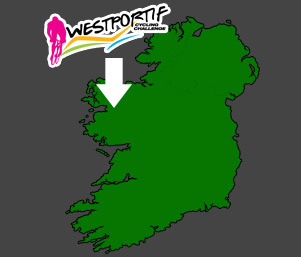 Cyclists of all abilities made their way to Westport for the Westportif Cycle Challenge in anticipation of a great weekend of cycling, despite the wet and windy conditions that participants had to endure. Over 70% of the participants were from outside of Connacht, Westport’s name as an adventure capital of Ireland still has a big draw for fitness enthusiasts. Even though a good few of the weekend activities had to be cancelled due to the strong winds on Friday and the heavy downpour all day Saturday. Weather in Ireland has its way of making sporting events dodgy to organise but this didn’t deter the main event from been going ahead. On Saturday massive numbers took to the start line that were lead around the town by Minister Michael Ring and Bobby Kerr of Dragon’s Den. The light mild rain at the time didn’t affect anyone’s moral, at the food stop at the beautiful Delphi Resort the wind was that light that even the midges were out to feed.